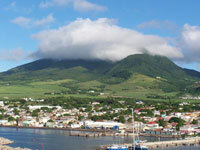 Got a question or comment about Attractions in St Kitts And Nevis? Ask a Travel Expert! Saint Kitts and Nevis makes provision for both beachgoers and outdoor enthusiasts. The beaches are the main drawcards, with visitors enjoying the dual pleasures of both the Caribbean and Atlantic Oceans. Favourites include Frigate Bay South, where the Strip operates as the island's prime nightlife and entertainment hub. There's also the seldom crowded Frigate Bay North, while Majors Bay is a pristine golden shore with calm waters. Visitors are also enticed by Pinney's Beach on Nevis, widely acknowledged as one of the best beaches in the Caribbean. Oualie Beach on Nevis is a magnet for celebrities, while also being ideal for scuba diving and other water sports. Pump Bay and Belle Tete Beach offer something different, sought after for their black and grey sand. Mount Liamuiga and Mount Nevis are ideal for those looking for outdoor adventure, while the Royal St. Kitts Golf Club offers a getaway for avid golfers. Those who are only in the country for a day should consider doing a circuit on the Scenic Railway, which takes in a lot of the island scenery. Finally, history buffs may be interested in the UNESCO-listed Brimstone Hill Fortress and Alexander Hamilton House.